Flickr just announced the launch of Flickr Stats for Flickr Pro accounts. Who doesn’t love stats? Now having them on my Flickr account makes me incredibly happy. Here is a detailed look at what Flickr Stats has to offer on the day it launched. Flickr Stats is only available to Pro users at this time; for you to use this feature, you will need to upgrade your account to Pro status. Once you do that, then you can activate your stats by going to Flickr Stats and clicking “activate.” Flickr then tells you to check back in 24 hours, but it only took five minutes for my stats to appear. Directly under that data, you will see “Daily aggregate views on your account.” This provides a line chart over the past 28 days (to start) of views you had on your pictures at Flickr. As you can see by my chart below, December 11th was a popular day for my Flickr pictures. I had a total of 5,647 views on my pictures at Flickr and one person even marked one of my photos as a favorite, but no one left any comments for me that day. Then Flickr shows me a look at my total view counts by individual photos, photostreams, sets, and collections. Obviously, I need to make more sets and collections–I am way too unorganized when it comes to that. The next section is my “most viewed photos” from yesterday and all time. Here is my overview: I guess Yahoo Holiday Gifts is a popular keyword phrase this time around, even though the picture was from 2006. As you can see, it also shows the number of “favorites” and comments for that picture during that time frame. Clicking on the photo will break down more information on that photo. I will review that later. The next picture shows you the “referrers,” or how people came to your photos. 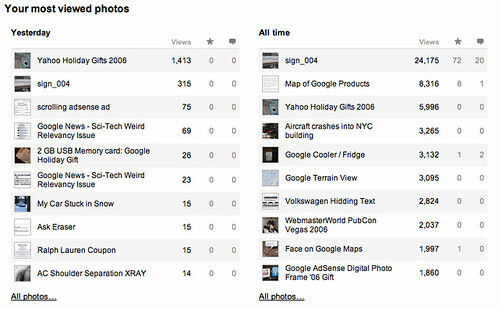 Flickr breaks out referrers from Flickr, Search Engines, “Other Sites,” and Direct Traffic. “Other Sites” are typically from sites that are linking to your photos. A referrer is logged when a user clicks on your image and is referred over to Flickr to view your photo. Note, Flickr cannot track photo views on 3rd party web sites. At this time, it does not appear to break down referrer only from search engine, but they do offer you a report to all referrers, not categorized by type of referrer. 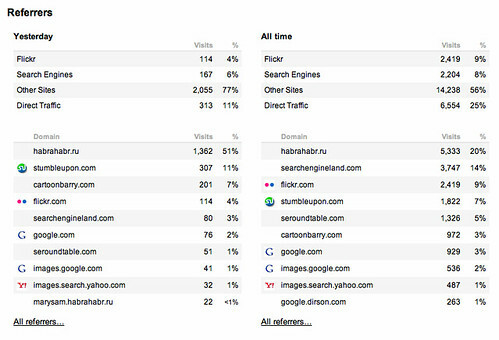 From the report below, you can see in the “All time” area that a site called habrahabr.ru sent me 20% of that traffic, while Search Engine Land only sent 14%, Flickr 9%, and StumbleUpon and Search Engine Roundtable both under 7%. Clicking on the referrer will give you more information on that referrer. I will review that later. The final overview report is a “breakdown of your photos.” I can quickly see that I am a very sharing person, with most of my photos being public, while only 26 are private, 328 are for family only, and 554 are for friends and family viewing. I forgot to tag 81 of my photos, and Flickr links you to those photos to go tag. Most of my photos are not geotagged, which is fine. Most of my photos are not in sets and groups. Most my photos were viewed but 607 were not viewed! Sadly, I only have 83 pictures with comments on them and only 56 were favored – not a good ratio. Like I said above, clicking on a photo will give you more detailed stats on only that photo. Here is a popular photo of Rand Fishkin of SEOmoz from last year’s PubCon Vegas. You can see Rand giving a massage to one of the Yahoo girls in Hugh Hefner’s Palms suite. …followed by some other stats on the photo, including number tags, number of notes, number of comments, number of favorites, number of sets, number of collections, and number of groups. How about those referrers; what is up with the habrahabr.ru referrer? When you click on the “view all referrers,” you are able to then click on a specific referrer, which opens up more details. The details not only include the number of referrers you received from each location from yesterday, this week, last week, and all time, but it also gives you the actual URL of the page that is linking your photo. With a total of 422,409 views on my photos, you can value the importance of linking your photos back to your blog posts. Check out my blog post on Using Flickr in your SEO & Traffic Building Strategy for more on that. Still have questions? Check out the Flickr Stats Help page.